It was a full house at the Masonic Hall in Ramsey on Friday, as the Rotary Club staged an evening of entertainment from the Magicians of Mann. Rotarian and opening magic act Keith Greenland said the fact they could have filled the hall twice over showed the appetite for live events in the town … Mike Daniels produced a bottle of wine from his umbrella, and about 20 feet of cloth from his hat and mouth to keep the kids’ heads scratching. Ramsey Rotary Club held a successful fundraising evening of magic at the Masonic Hall on Lezayre Road, with a sell-out crowd helping to raise £671 for the Rotary International Foundation, and the Magicians of Mann, who performed on the night. The cross-generational audience lapped up the displays of tricks and illusions with good humour, as no less than nine magicians each performed a 10-minute set. 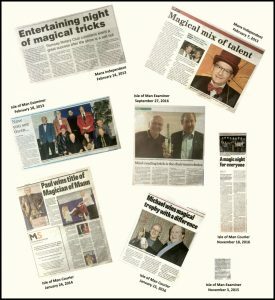 A truly magical evening took place at the Palace Hotel and Casino on Friday when the Rotary Club of Douglas staged a family magic show in conjunction with the Magicians of Mann … The final act in the first half of the show was Michael Daniels, whose act was linked to the history of magic. His ‘Cups and Balls’ routine was brilliant, according to Mike Clague, the secretary of Musicians [sic] of Mann, as was his performance of the ‘Chinese Linking Rings’. Michael borrowed a spectator’s phone and ‘Googled’ something. Colin Boardman is the 2015 Magician of Mann. He was winner in a competition that was part of a ‘sold out’ show held at Bunscoill Rhumsaa recently, organised by the Rotary Club of Ramsey … Michael Daniels followed, and amazed everyone with a series of ”bunko booth’ tricks including a three-card swindle that was vastly more amazing than the version still seen on the streets of some larger cities. It was also seen on the streets of Douglas in the 1800s, with many of those involved being marched to the boat having been expelled from the island. Michael was spared that indignity! An Onchan magician has conjured up a trophy with a difference after scooping the annual Magicians of Mann competition. Michael Daniels won the competition, held at the Columba Club in Douglas, and was awarded with an unusual trophy in the form of a solid wine bottle that contains a sealed pack of playing cards. Michael performed an act which mysteriously linked and unlinked four steel rings and a finger ring to win the competition. Other magicians who took part in the event were Chris Burns, Mike Clague, Keith Greenland and John Cain. Michael Daniels was the winner of the Chairman’s Challenge when the Magicians of Mann staged their annual competition last week. The event, which took place at the Columba Club in Douglas, involved club members performing a single trick, judged by chairman Paul Martin. After much deliberation, he awarded the unusual trophy to Michael, who was also the winner in 2015, for a mind reading trick that was extremely puzzling, in a very entertaining way. The trophy is a very unusual wine bottle, pictured, that contains a number of magical items, including a full pack of playing cards in a sealed box. Also taking part were Chris Burns, Lez Diamond, Keith Greenland and Fredrik Stromberg. The Centenary Centre in Peel resounded to laughter and gasps of amazement when the Magicians of Mann staged An Evening of Magic in the very full theatre. During the show … nine performers competed for the Arthur Culpin Challenge Cup … A fantastic Rubik’s Cube trick by Michael Daniels was next, which was appropriate as the game was originally called the Magic Cube. Michael proved why you should never play the Three Card Game.